Take a look around in nature, and you will see thousands upon thousands of examples of symbiotic relationships between different organisms. Symbiotic relationships are those in which both parties experience mutual benefits. Think of the clown fish and anemone in Finding Nemo. As Health iPASS continues our mission to lead patient revenue cycle management we continuously seek this type of win-win relationship with those who swim in our same industry fishbowl. As we have mentioned on our blog before, Health iPASS is always monitoring the patient revenue cycle marketplace for new avenues toward helping our clients increase operating income, provide greater price transparency, and reduce bad debt and aged A/R, all while providing the excellent patient experience the modern healthcare consumer craves. That’s why we are excited to announce our partnership with DoctorConnect, a known industry leader in automated appointment reminders with a full suite of operations-enhancing capabilities. Our strategic alliance with DoctorConnect will enable Health iPASS to significantly expand our footprint in the healthcare IT space by leveraging and expanding our prospective networks. According to Catherine Sampels, Director of Sales at Adtel International, “We are honored to partner with Health iPASS. We believe the integration of our platforms will improve front and back office efficiency, revenue [collection], and patient experience. We are excited to offer our existing clients a way to automate patient payments with Health iPASS.” By combining our platforms, clients can experience the patient revenue cycle benefits provided by Health iPASS, as well as the added layer of patient communication touch-points provided by DoctorConnect. 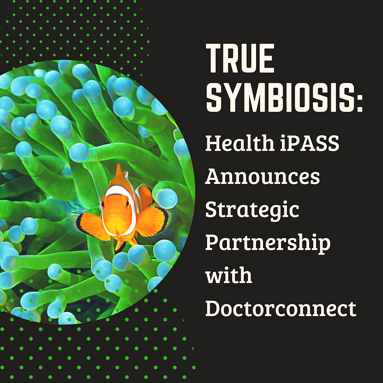 We at Health iPASS are confident that our partnership with DoctorConnect will prove to be a true symbiotic relationship and that we will each learn from and grow with each other. With two big fish in the Chicago healthcare IT pond swimming together, we expect to achieve great things! For the full story, check out our press release regarding this new partnership.